Mud Bins Furniture Store with a wide range of Home Furnishing Products. We feature ready to assemble and custom made items. A Great Hold Everything Set Of Bins. A must in every entry way, garage, laundry room or wherever it is needed. A great way to organize the stuff you either bring home with you or need when you leave the house. Holds everything from muddy shoes to newspapers to you name it.Please note the picture displays three units stacked. 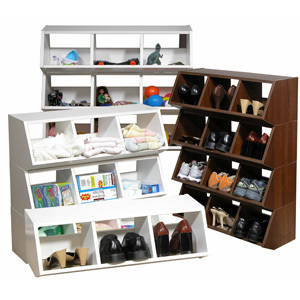 4860 Features: Constructed from durable melamine laminated particle board Rugged, sturdy construction Multi-purpose storage Modular Stackable Water and stain resistant Each section sold separately Made in the USA Assembly required Finish: Alder Dimensions: 32 In. (W) x 12 In. (D) x 10 In. (H) Item Weight: Approximately 15 lbs.